In the build up to their only UK show on Saturday 9th March at Koko London, Sir Bob Cornelius Rifo, aka The Bloody Beetroots recently launched his own Social Network called The Real Church of Noise. Using the same team who developed Lady Gaga's Little Monsters, the social network is totally unique to the Beetroots, and is fully integrated with YouTube, Soundcloud and all other social media platforms. 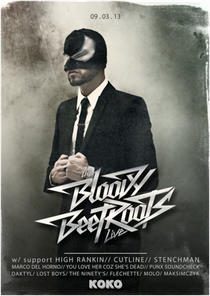 The idea is to create a network of users specifically interested in The Bloody Beetroots and other like-minded artists, with users having to request a profile page before being granted access to the site. After spending the last summer touring the world with The Bloody Beetroots DJ Set and taking a sabbatical from live performing, Sir Bob is coming back to his European roots for nine exclusive dates, with KOKO his preferred London destination. Support at Koko comes from dubstep and electro artists High Rankin, Cutline and Stenchman, with Birth Records hosting various other artists in Room 2.